A newly developing area of Naha City is becoming Okinawa’s haven for shoppers who have no patience for flitting from area to area, store to store. Omoromachi, once the sprawling setting for a U.S. military housing area known as Machiminato, is now becoming the shopping and entertainment hub of downtown Naha. Situated just north of the ages old downtown, straddling Highways 58 and 330, Omoromachi and its primary local area, Shintoshin, is home to countless new apartment buildings, condominiums and, of course, stores. The hub of the new downtown, which will ultimately spansive new city and prefecture office buildings, together with dozens of key businesses such as the Okinawa Times newspaper, is set primarily along a single main thoroughfare which begins at Ameku on Highway 58, and runs west to connect with the Omoromachi monorail station. 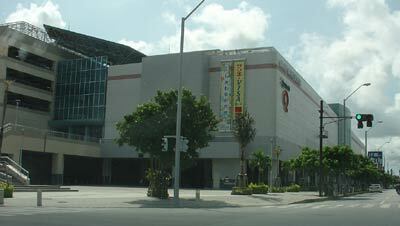 The cornerstone shopping mall in the area, turned back to Okinawa from American military control some 25 years ago, is Naha Main Place, built in 2002 to cover some 127,060 square meters. Shopping of all sorts, plus a good many other activities, fills two floors of the six story building, leaving four others for much needed parking. Naha Main Place is owned by San-A Corporation, a large Japanese shopping and supermarket company with stores all over Okinawa. We’ll tell you now that there’s a new “twin” to Naha Main Place, Nishihara City located in the fast-growing northeastern suburb, Nishihara. But today we’re in Naha Main Place, where the 70 stores, outlets and other tenants are generating Y18 billion annually, with your help, of course. There are more than one thousand employees working to serve customers. Naha Main Place is not for the easily intimidated shopper. It is a paradise, best explored over a period of hours (and with the spouse along to tend the children while you concentrate on the hundreds of items you’ll find you want. Naha Main Place is NOT a place you swing by to pick up a single item. Good, comfortable shoes are a must. If there is a drawback to shopping there, it’s the initial time consuming business of finding a good parking space among the 4,000 available. But once in, it’s easy to find at least a half-dozen purchases you simply cannot live without. The first floor has Comme Ca Ism and the Super Suits Store as anchor tenants, surrounded by a restaurants zone on one side, a variety of boutiques on the second and third, and a bevy of one-of-a-kind stores on the other. Before we give some insight to the shopping wonders, we’ll note that one of western civilization’s most popular coffee shops, Starbucks, is right there on the ground floor. Perfect place for dad to slip away from the enthusiastic shoppers in the family for a respite. It’s hard to say what’s the best, because it’s all relative to individual shopping tastes, but TheCenoZoic is a must-visit. Calling itself the Total Creative Zone, it’s filled with knickknacks you simply must have to brighten your home. It is one of those rare stores it’s virtually impossible to walk away from without having made a purchase. One the same stretch of hallway you’ve meet Mamaikuko, another specialty store, Tajimaya, a bags shop women find irresistible, and Day By Day, a shoe store with many fashions simply not found in AAFES shoes sections. Beware of the second floor if you’re in the company of kids. They’ll quickly get excited at the Namco Land kids zone, which features every amusement ride possible (that fits inside a building). 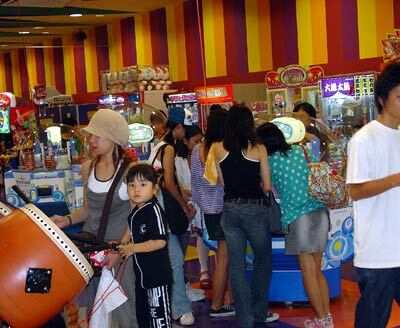 There are music pods, video games, rides, and more than an adult can even remember. The plus, of course, is that this kids area takes school age children off your arm while you’re shopping. The island’s newest and most exciting movie theaters are at Naha Main Place. Cinemas Q has seven screens showing the latest international and American films, as well as Japan’s top fare. Prices are typical for off base theaters, with adult ticket prices averaging Y1,600 for a first run motion picture. The second floor is a maze of diverse shopping challenges. Name brands mixed with specialty labels including top European designs are everywhere, including Missel, Infine, Wing, Molsok and Tender Kids. There are computer stores, Excel World and Nova, and a much-needed Food Court to minister to your hunger and thirst. 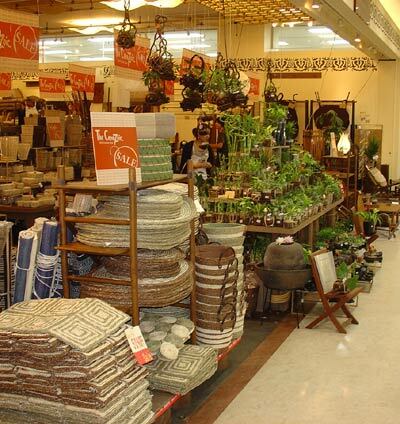 And of course, no shopping haven is complete without an essential store, and Naha Main Place is no exception. Breath easy…there is a 100 Yen Plaza waiting for you. The focus has been on Naha Main Place, but wait, there’s more. A mere block away is a second hugh shopping center, Hypermart. A cornerstone client there is Toys R Us, and yes, it’s pretty close to what you’ll find back home. It’s worth a look. And still other strip malls are popping up along this new shoppers paradise. Sports Depot has everything for every sport imaginable, and they do sports equipment repairs (such as restringing tennis racquets). Omoromachi is quickly making a name for itself as a nightspot, with dozens of quality restaurants and izakayas blended in with the name stores such as McDonalds. Shopping and dining are whatever costs you elect to incur. Only a few stores accept dollars, so carry plenty of yen. There are ATM machines, but the Japanese may be more than you wish to tackle, without getting frustrated. By taxi or car, drive south on Highway 58 from the military bases. As you enter downtown Naha, you are at Ameku. The landmark signaling a left turn is the towering blue Ekka Hotel. The sign signaling Omoromachi Monorail Station is the backup clue. The second choice is to travel south on Highway 330. At the Omoromachi Monorail Station, turn right. There are several entrances to the parking levels of Naha Main Place.